These live recordings were all made at the regular concert series of the Tokyo Kosei Wind Orchestra. Combined with several further discs by the same ensemble to be reviewed for Musicweb in due course they collectively provide a useful demonstration of the quality and sheer diversity of music now being written for symphonic winds by composers both in the United Kingdom and on the continent. For the last twenty years or so Guy Woolfenden has been at the heart of this freshly invigorated interest in the medium along with fellow former horn player Timothy Reynish, for many years a teacher at the Royal Northern College of Music in Manchester. It was Reynish who commissioned Woolfenden�s suite Gallimaufry in 1983, a work that has gone on to see tremendous success and countless performances. The piece started life as incidental music for Shakespeare�s Henry IV, one of over one hundred and fifty scores that Woolfenden produced during his thirty-seven year tenure as Head of Music at the RSC. The reasons for its popularity are immediately evident. Cast in six brief movements that play continuously (the title quite literally means jumble or medley) the work is abundantly tuneful and deftly scored. A dignified opening, appropriately entitled Church and State, returns at the close in emphatic grandeur whilst of the central movements, Inn and Out is an appealing dance like portrait of the revelry at the Boar�s Head Tavern, subsequently spilling over into the tavern brawl in Starts and Fits. At the heart of the work is Father and Son, a touching elegy eloquently portraying Prince Hal�s relationship with his father and Falstaff. Woolfenden�s work provides a convenient link to Edward Gregson�s The Kings Go Forth, also coincidentally stemming from music originally written for RSC productions of The Plantagenets and Henry IV parts I and II between 1988 and 1991. The piece was premiered in 1996 and to the substantial instrumental forces the composer adds voices, perhaps not altogether successfully until the bars leading up to and through the majestic conclusion. Gregson is a master of scoring however and the instrumental writing is characteristically vivid and packed with excitement, dramatic effect and incident. The Dies Irae figures prominently in the opening movement, whilst the fanfares that open the piece return in various guises throughout. In contrast the initially hymn like central movement (again drawing on the fanfares from the beginning) soon gives way to a jazzy treatment of the well known medieval tune Sumer is icumen in. The final movement is initially centred around the battle scenes and subsequent funeral music for the two kings before the fanfares once again return to conclude the work in a blaze of glory. The American composer Stephen Melillo provides a very different piece to open the disc. Concerned with the ascent of humanity through the ages I would recommend that the somewhat pretentious programme be ignored in favour of the music itself. What emerges is a piece of striking drama, again scored with considerable élan and full of rhythmic and melodic incident. In point of fact the music is not necessarily melodically individual and I found myself thinking of numerous John Williams film scores during the opening movement as well as the Joseph Schwantner Percussion Concerto on a number of occasions. However it hardly matters when the scoring and ideas are presented with the panache that they are here. Listen out for the haunting slow music of the central movement, which is particularly affecting. Without a shadow of doubt the odd work out on the disc is Percy Grainger�s The Power of Rome and the Christian Heart. How the piece came into being is a story in itself for Grainger originally scored the work for full orchestra and organ, subsequently re-scoring it for wind band to fulfil a commission that he did not feel he could otherwise complete, whilst openly admitting his self crib. Sadly the organ used on this recording is a sorry substitute for the grand instrument that the composer surely had in mind. The material for the whole work is drawn and developed from the opening solo organ bars, the tone of the piece sonorously subdued for the large part, a fact that is explained by the enigmatic title, referring to Grainger�s thoughts on the futility of the individual�s battle against the forces of authority. In particular the piece says much about the composer�s anti-war stance and the plight of soldiers recruited to fight against their principles. Interestingly the piece was completed in its original orchestral form in 1943 but had been commenced in 1918, therefore straddling both world wars in its long gestation. Grainger�s version of Country Gardens, included as an encore given at the live concert recording, could hardly be in sharper contrast to the profound and deeply personal expression of his tone poem. It is therefore perhaps fortunate that it follows the Gregson work and not the touching final bars of Grainger in "serious" mode. 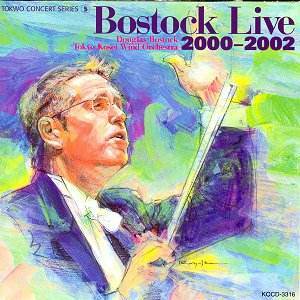 It does however provide a lighthearted conclusion to an enjoyable and interesting disc, performed with technical dexterity and undeniable spirit by Douglas Bostock�s Japanese players.